The Islanders finally notched their first win of the season last night. Superstar in waiting, John Tavares, won the shootout with some nifty moves before whipping the puck past Carolina goaltender Cam Ward. 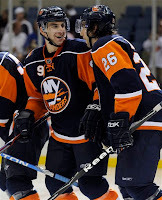 "Coach Scott Gordon chose John Tavares to go third in the shootout to see how the No. 1 pick approached the pressure situation. Tavares helped the Islanders avoid the worst start in franchise history, scoring the clinching shootout goal in the Islanders' 4-3 win over the Carolina Hurricanes on Wednesday night. The coach wanted to see but the Islanders' fans... did they? An announced attendance of 9,122 was on hand to "witness" the victory. Sure it has been a rough start, but the top pick of the 2009 Draft is on the ice every night. Yes, it took a while to get a win, but the Isles have been competitive nearly every game, as witnessed by the 3 overtime/shootout losses. The Isles are improving and are worth watching. There were plenty of you at the Draft Day Party. 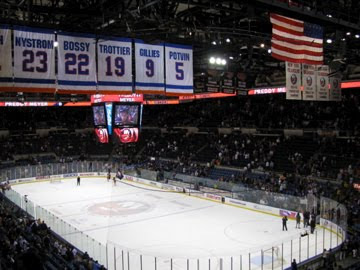 Where are you Islanders fan? Good post, Plumber. I very much agree and very much enjoy rooting for these guys. They have plenty of distractions to fight thru on and off the ice (rebuilding the house as in lighthouse vs rebuilding the team from drafts/prospects as in some rough seasons). I love the commitment to the youth and Snow backing Gordon's approach of playing the younger players a lot and putting them thru the test. Their going to grow a great team. And you are right. Okposo and Bailey are very good players and two of may faves. Also, will need to keep an eye on 'the other 2009 first round pick', Calvin de Haan on D. When he comes up to the big barn, I think he will adjust to the NHL game fairly quickly.